Arsenal have been dealt a major double injury blow ahead of their Champions League clash with Borussia Dortmund on Wednesday with the Mirror claiming Jack Wilshere and Kieran Gibbs have been ruled out through injury. Wilshere missed Saturday’s 2-0 defeat of Liverpool and the newspaper claims it was due to the midfielder picking up a fresh ankle injury after ‘rolling’ it in training on Thursday. Luckily, it appears the damage has been done to the left ankle and not the right ankle which has been the 21-year-old no end of problems over the past two seasons. No official word on Wilshere’s fitness has come out of the club as yet but the Mirror claim he’s out of Wednesday’s crucial game with Dortmund and is now not only a major doubt to face Manchester United at Old Trafford on Sunday, but could also miss England’s upcoming friendlies against Chile and Germany. In further bad news for the Gunners, the report also claims that left-back Kieran Gibbs is likely to miss our midweek clash in Germany which would also make him a doubt to face United. Gibbs was forced off in the second half against Liverpool with a calf injury and Nacho Monreal is now on stand-by to fill in. If proved accurate, it will be another injury blow to Arsene Wenger who’s already having to cope without the services of several first team squad players and the Frenchman will be forced to take a thread-bare squad with him to Dortmund for what could prove to be a pivotal game in their search for qualification to the knockout stages. 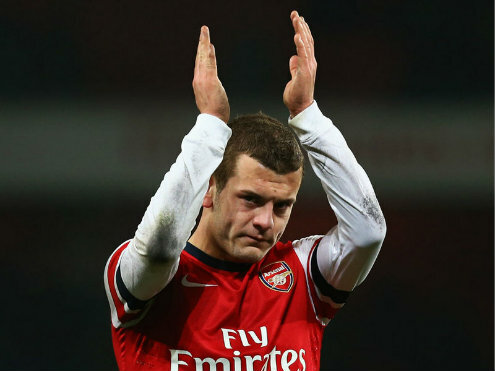 How big a blow is it to lose Wilshere and Gibbs? Can we cope? Share your views below. In the place of Gibbs we have the club captain and Monreal as good replacement, but for Jack we might feel it because of many other midfeilders with injury. Not having a strong bench when your first eleven are on, is a great problem to worry about, because of injury and this the clubs problem now. Look at chelsea, in every department, they have good replacement when injury stricks. Arsenal dont have that. A case in question is the attack. If Giroud should have injury, who is the good replacement from the bench for him. And so I will humbly plead with the clud coach and board to look into it, if they have a desire of winning any trophy. Great to have quality in depth in left back position, have no worries there but I’m wondering if Wenger will still be thinking ahead at the Man U game and pick his squad accordingly as I would prefer to prioritise this game over Dortmund. This will be a chance to smash Man U while they are vulnerable, Old Trafford is no longer a fortress and the 3 points is there to be won with a empathetic win to put all the critics to bed who still think we are not title contenders. 5-1 to the Gooners!! !